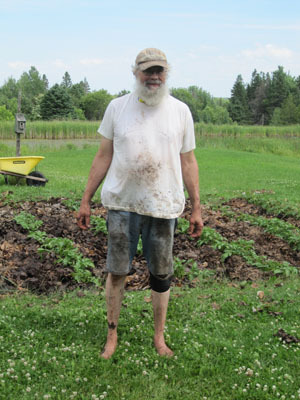 Today we finished hilling the potatoes, tilling between the rows, and mulching the potatoes. This mulch job was the final one for the gardens. It is good to get it done, but the bags of leaves and yard clippings took on a strange attribute after sitting outside this summer. The City of Hancock wisely requires its residents to use biodegradable corn-based leaf bags for their yard waste. When exposed to sunlight, these bags just disintegrate. The part not exposed to light, however, does not. So my pile of bags of leaves, being exposed to sunlight, all had holes in the tops. When it rained, which it has done a lot of this summer, the water got into the bags through the top holes, but got trapped in the bottoms of the bags. This made the partially bagged leaves into a tea colored soupy stratified glob. Someone had to wheelbarrow the bags into the garden, empty them into the rows, and spread them out across the rows and around the plants. You might think it would be possible to do this chore without getting dirty. I would agree with you that is might be theoretically possible, but it didn’t work that way for me today. While Alice was happy that I was the one that did this work, she was particularly stand-offish when I tried to give her a big hug to celebrate the completion of the mulching of the potatoes. After a long shower this evening, the stand-offishness seemed to disappear. This entry was posted on Sunday, July 14th, 2013 at 10:36 pm and is filed under Uncategorized. You can follow any responses to this entry through the RSS 2.0 feed. You can leave a response, or trackback from your own site.